Arianespace’s marked the halfway point in its fast-paced 2015 operational schedule today with the 66th consecutive successful Ariane 5 launch, which deployed two satellites into geostationary transfer orbits for very diverse roles. Ariane 5 Flight VA224 lifted off at the beginning of its launch window at 6:42 p.m. local time from the Spaceport’s ELA-3 launch complex in French Guiana, carrying a mixed-mission satellite payload composed of the Star One C4 telecommunications relay platform for Embratel Star One and Eumetsat’s MSG-4 for meteorological monitoring. With an on-time departure from the Spaceport, Ariane 5 climbs away from French Guiana carrying the Star One C4 and MSG-4 satellites. This evening’s success at the service of two-long standing customers – Brazilian operator Embratel Star One and Europe’s Eumetsat – also reaffirms Arianespace’s dual goals: to be a leader in commercial space transportation and guarantee Europe’s independent access to space. This 40-minute flight marked another mission accomplished for Arianespace’s reliable Ariane 5, which carried a total payload of nearly 8,590 kg. on its 80th launch from the Spaceport in French Guiana. Ariane 5 lifts off from the Spaceport in French Guiana to begin its successful Flight VA224 with Star One C4 and MSG-4, which were the 511th and 512th spacecraft launched by Arianespace. - Perigee: 249.5 km. for a target of 249.1 km. - Apogee: 35,929 km. for a target of 35,904 km. - Inclination: 3.99 deg. for a target of 4.00 deg. He also recognized the key support of European Space Agency (ESA) member states, the French CNES space agency’s personnel at the Spaceport in French Guiana, along with the industrial companies that support the launch site’s ground infrastructure and Arianespace’s teams in establishing Ariane 5’s unrivalled track record of success. Riding in the upper position, Embratel Star One’s Star One C4 was deployed first in the flight sequence at just over 28 minutes after liftoff. This telecommunications satellite – which was designed and built by SSL (Space Systems/Loral) – will reinforce direct-to-home services in Brazil, while expanding access to other Latin American countries, and the mainland United States for Embratel Star One, which is the largest satellite operator in South America. 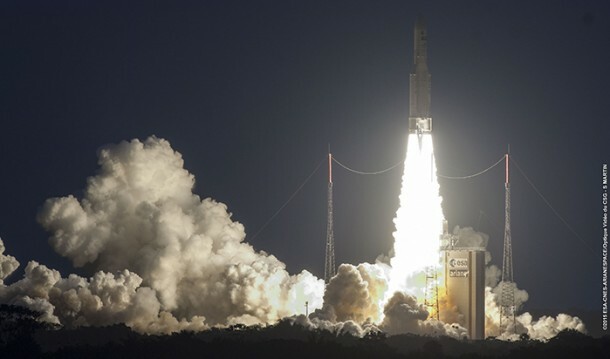 The deployment of Star One C4 continues Embratel Star One’s 30-year collaboration with Arianespace, during which the launch service provider has lofted 10 satellites for this Brazilian operator. 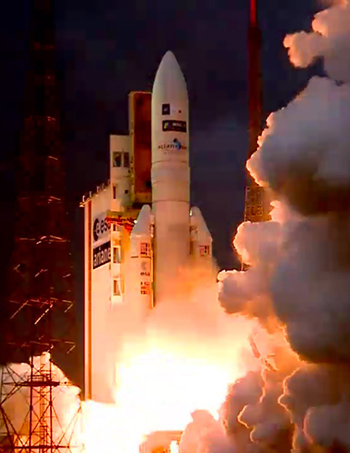 Europe’s Eumetsat weather, climate and environmental monitoring organization is another long-time partner of Arianespace, reinforced with MSG-4’s successful separation some 40 minutes after Flight VA224’s liftoff – marking the latest step in a relationship that extends back to Arianespace’s beginnings. Produced by Thales Alenia Space, MSG-4 is the 10th Meteosat satellite launched by Arianespace, as well as the fourth and final satellite in the Meteosat Second Generation (MSG) series of spacecraft, which play an important role in supporting the detection and forecasting of high-impact weather. MSG-4 is being stored in orbit following its launch and commissioning. Once operational, it will be renamed Meteosat-11, and bridge the gap between Meteosat-10 (launched by Ariane 5 in 2012) and the first Meteosat Third Generation (MTG) satellites, which are planned for launch in 2019 and 2021. Flight VA224 was Arianespace’s third heavy-lift mission so far this year, following Flight VA223 on May 27 and Flight VA222 on April 26. Arianespace also has performed two light-lift Vega missions (Flight VV04 on February 11, and June 22’s Flight VV05), along with one that utilized its medium-weight Soyuz vehicle: Flight VS11 on March 27. Next up in the company’s launch manifest is another Ariane 5 mission – Flight VA225, which is planned for August 20 to deploy the EUTELSAT 8 West B and Intelsat 34 broadcasting/telecommunications satellites to geostationary transfer orbit.